Animal Rights Activists stage peaceful demonstration, ‘call for Justice’ as part of Vegan India movement! 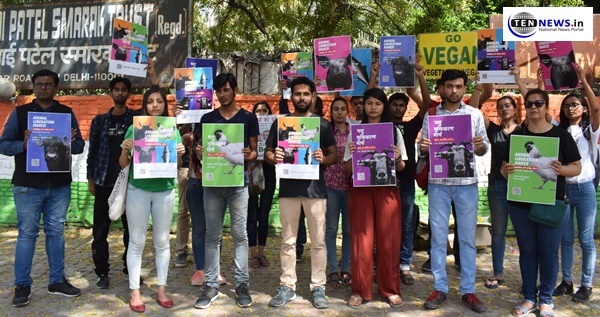 New Delhi : (29/03/2019) Today, Animal Rights Activists in Delhi came together at Jantar Mantar for a peaceful demonstration and called “Call for Justice” as part of Vegan India movement. The event was held in 20 other cities apart from Delhi. The activists silently protested with placards carrying messages of kindness and compassion towards animals. The main endeavour of the event was to promote the `Animal Liberation March’, to be held in Mumbai. Animal rights activists all over India will come to Mumbai on 28 April 2019 to seek justice for Animals. The activists will gather at Shivaji Park. The main purpose of the March is to give the animal rights movement in India a sense of unison and to promote veganism. Veganism is a fast growing social justice movement. It is basically the idea that animals exist for their own reasons and shouldn’t be exploited. Apart from not eating meat, eggs, dairy products/milk and honey, being vegan also means completely avoiding any animal-tested products or any product or service that involves use of animals. “The endeavour is to urge people to re-think about the commodity status assigned to non-human animal persons on the arbitrary and unjust basis of species”, explains Amjor, one of the organisers. IPL 2019, SRH vs RR Preview: Who will win?